The guitars that I have already built could be sold too. It takes about 7 months to design, build and finish the guitar. A lot of options are possible. 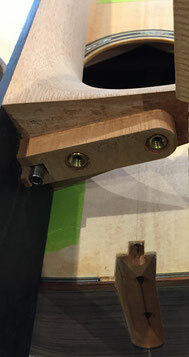 The neck jonction to the body is either a dovetail or a bolt-on. Hard to write down the exact price as it depends on the wood and work choices (inlays...). It takes about 3 months to build an electric instrument. Once again, a lot of options available. The neck can be also bolt-on or glued. Here, the pickups can make the price higher, depending on your choice. Come and build your own instrument! For the same price as the ones listed above, you can come over and become a trainee. 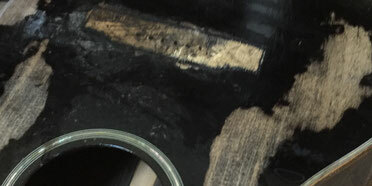 The workshop is at your disposal, as is the luthier and his knowledge, and the hard or dangerous work will be done by him if you're not confident enough.